Even if English is your first language, but particularly if it is not, during your presentation you are likely to stumble over the big words. And sometimes even the little ones. Here’s an embarrassing story about how I got into trouble because of a pronunciation mistake (somebody else’s) combined with stupidity (mine). It was during a project in our aerospace faculty that involved students from abroad, innovation specialists from one of the main aircraft builders and everybody who was anybody in the faculty. During lunch, one of the Dutch organizers of the social program was talking about how it had been challenging for her to organize a special camel tour for the students, which had taken place the day before. Maybe it’s because on the whole her pronunciation was really good, but it took a long time, a very long time, much too long a time for me to realize that she was mispronouncing a word. 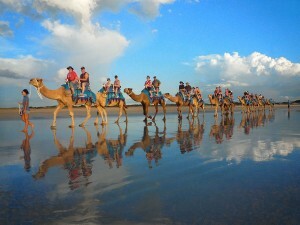 It’s just that I wouldn’t put it beyond TUDelft to actually organize a camel tour for real. And she kept saying things that would make perfect sense in a talk about a camel tour. ‘The camels are really nice’, ‘Not all the students have seen a real camel’, ‘Only some of the students had ever been on a camel’, but also the strange and puzzling ‘They are very different from other camels’, and I still didn’t catch on! Finally she said: ‘We could not fit all the students in one camel boat’. In a prepared presentation, however, any language issues are the responsibility of the speaker. This means that it is your job to make sure that you are understood and understandable. Words like “regenerative desulfurization”, “peroxidases”, “mesophilic sludge” should be treated with proper respect, and so should your audience. Mispronouncing their jargon may be construed as uninterestedness. ‘If you can’t even be bothered to learn to “speak the speak”, why should we believe that you should be taken seriously?’ If you look up, practise and take your time to pronounce words like “toxicity” slowly a nummer of times, I promise you will get it right during your talk and your audience will be able to understand what you are talking about. You can find the pronunciation of the words above (yes, they are real words, I did not make them up), and many others on howjsay.com. The word “canal” is pronounced with the stress on the second syllable, the word “camel” is pronounced as “Bob”. Previous Previous post: Never be afraid to try something new even if it is 60 years old.